Best and easy way to start earnings by using our advanced new Referral Revenue Script which helps the new entrepreneurs to start large profits and earnings in a short span of time. The main advantages of using our script is that the user gets more profit by using our Paid to Click Script is that the user can share their shorten URL for images, links etc, and can share on the banner advertisements and social sharing networks for the every clicks the user and site owner can get pay commission based on the return profit. This is the prime script in getting more profits by forming the networks clicks in a short period without any investment. This Readymade PTC Php Script is designed and developed by our experts where they customized and developed the script based on the business understandings that earn money by starting your own convertible link shortening service. This script is high on demand among the entrepreneurs, where the users can earn money by showing ads and when the users click on the shortened links. The user can have the specialized function to control the CPM for each country, where the user can able to change the cost of each ad on the different country, which is displayed on the campaigns and also by registering the account with membership plans. In our Php Revenue Sharing Script the user dashboard has specialized features and functionality, where the user can manage the total view of the clicks which are published on the overall sites, and also can view the total earnings which are earned from the referral clicks or ads clicks. We have integrated major of the payments gateways like PayPal, Stripe, Wallet money etc. It is easy for the users to withdraw the earnings amount by using simple and secure withdrawal system. 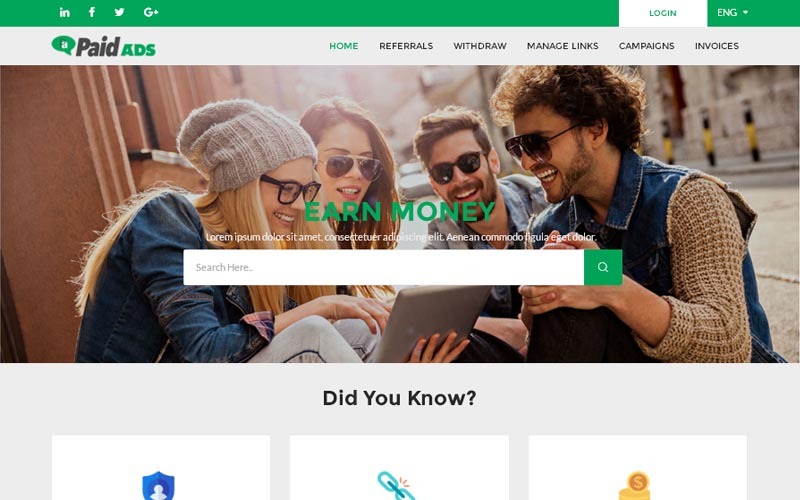 As we analyzed that the referral program is a great way to spread the shorten link of this service, is much easier and simple way to earn the money, so we have developed this Referral Revenue Script. The Paid to Click Script has the admin portal where the overall site control management is controlled by the admin, as we mentioned above the site admin can also get the profit because we have used revenue generating models by using the banner advertisements, Google ads and other ads and also get profit while the user posting the ads user should be pay the cost for publishing the amount in Advertising Rates. The admin has authority to accept or decline the user registration request, payments, and amount withdrawal request. The admin has the ability to manage the general settings and social links of the scripts. We have integrated the major functionality features and resources for the admin and users to make the script more user responsive and user-friendly customization. After the purchase of the script, the script will be live within 12-24 hrs from the time of the purchase and also we provide 1-year technical support, 6-months software free update and bug-free code with SEO-friendly URL.